The Seaplane Pilots’ Model Code of Conduct (Code of Conduct) presents broad guidance and recommendations for seaplane pilots to improve airmanship, flight safety, and to sustain and improve the seaplane community. The Code of Conduct presents a vision of excellence in seaplane aviation. Its principles both complement and supplement what is merely legal. The Code of Conduct is not a “standard” and not intended to be implemented as such. To further the effective use of the Code of Conduct’s principles, Sample Recommended Practices offer examples of ways pilots might integrate the principles into their own practices. 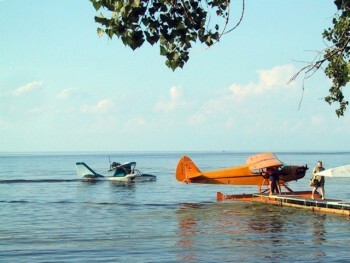 The Sample Recommended Practices (which include selected personal minimums) can help seaplane pilots and organizations develop practices uniquely suited to their own activities and situations. Unlike the Code of Conduct principles themselves, the Sample Recommended Practices may be modified to satisfy the unique capabilities and requirements of each pilot, mission, aircraft and seaplane organization. Some Sample Recommended Practices exceed the stringency of their associated Code of Conduct principles. They are not presented in any particular order, except that instrument flight rule (IFR) specific Sample Recommended Practices appear last. Note: Approach/departure IFR and night seaplane operations are not authorized in some jurisdictions, such as in Canada (except for authorized IFR pilots operating enroute or in amphibious aircraft). promoting seaplane aviation and making seaplane flying a more rewarding experience. Approach flying with the utmost seriousness and diligence, recognizing that your life and the lives of your passengers and others depend on you. Recognize, accept and plan for the costs of implementing proper safety practices (often greater than expected). Identify prevailing conditions and adapt to changing in-flight conditions based on sound principles of airmanship and risk management. Recognize the extreme risks associated with night water operations (due to the inability to see the surface and obstructions). Develop, use, periodically review and refine personal checklists and personal minimums for all phases of seaplane operations. Seek the input and review of these materials by a certificated flight instructor/experienced seaplane pilot. Recognize and respond to the inherent differences in flying a seaplane out of the system (e.g., out of controlled airspace). Know your personal susceptibility to hypoxia; carry supplemental oxygen on flights where its use may benefit you or your passengers; and establish O2 personal minimums—for example, daytime above 8,000 ft. MSL and night time above 5,000 ft. MSL. See and be seen. Employ techniques for seeing other aircraft, such as scanning, and techniques to enhance your own visibility to avoid other aircraft, such as the use of radio, lights, and strobes (except while taxiing or in instrument meteorological conditions (IMC)). Minimize turns and manoeuvres below 500 feet AGL (except as required for landings and obstacle departure procedures). Comply with or exceed the requirements for mandatory inspections and Airworthiness Directives (ADs), and voluntarily adhere to manufacturers’ recommended inspections, service bulletins and checklists. For cross-country operations, identify alternate landing sites and available fuel along the planned route prior to departure should deteriorating weather or other emergency circumstances make continued flight unsafe. Adhere to applicable flying club/school and FBO/flight centre rules and operating practices. Recognize that a seaplane is particularly susceptible to ice loading due to the float-related surfaces. Minimum descent altitude/decision height (MDA/DH) - exercise extreme caution and voluntarily limit approaches where ceilings are under 800 ft. AGL and visibility is under 1 mi. for under 1,000 ft. AGL and visibility is under 3 mi. for circling approaches. Never execute a circling approach at night unless there is no alternative and you are capable of safely executing such an approach. In deteriorating weather conditions and at night, observe higher minimums. Approaches - limit approaches to a maximum of two (in the same location under the same or deteriorating weather conditions) and do not prematurely cancel IFR. In an unstable approach inside the Final Approach Fix in IMC, execute the missed approach procedure. Departures - select a “departure alternate” landing site (for emergency landings just after departure), and depart only in conditions above applicable arrival or departure minimums (unless a nearby airport has an available ILS). Night operations – recognize the increased risks associated with night operations and fly IFR whenever practical at night (if rated and proficient). avoid operations that may alarm or annoy passengers or people near the seaplane. Explanation: You are solely responsible for the safety and comfort of your passengers. Passengers place their lives in pilots' hands, and pilots should exercise sufficient care on their behalf. Such care includes, but is not limited to, disclosing unusual risks and exercising prudent risk management. Pilot responsibility also extends to people near your seaplane. Keep your passengers as safe as possible—as though they were your closest loved ones. Complete a comprehensive, professional passenger briefing using a checklist as an aide. Require that passengers wear seat belts and shoulder harnesses, and consider the use of headsets (or ear plugs) during flight operations. Require each passenger to wear a Personal Flotation Device (PFD), and to understand its operation and limitations, including the dangers of PDF inflation prior to egressing the aircraft. Become familiar with and if feasible consider obtaining favourable insurance coverage for passengers and urge passengers to do so as well. Encourage passengers to serve as safety resources – for example, by having them identify nearby aircraft/watercraft, organizing charts, and keep track of landmarks. Screen unfamiliar passengers for safety and security purposes. Plan and conduct seaplane operations (including take-offs, approaches and landings) to minimize concerns and fears of passengers and parties in watercraft and on the surface. Do not over-fly boats or people below tree-top level. Neither land behind nor taxi alongside a sailboat as it may turn across the wind without warning. Give wide-berth to personal watercraft. Assume that watercraft do not see you. Neither land near an idle ski boat nor a boat pulling or retrieving a skier. Maintain proficiency at recognizing wind direction and water conditions for water operations. Recognize and respond to the special weight and balance issues affecting seaplanes. Become familiar with applicable boaters’ handbooks and regulations. Become a proficient swimmer/lifesaver and learn cardiopulmonary resuscitation (CPR). Complete an underwater egress course and become proficient in such procedures. Provide an instructive passenger briefing in advance of the flight. Determine the applicable experience, background and concerns of each passenger and incorporate them into the pre-flight briefing and flight activities. Brief passengers on underwater egress procedures, and have each passenger locate and open the nearest door with their eyes closed. Advise passengers that assistance may not be available when egressing the airplane in an emergency. Exercise extreme caution when permitting passengers to assist in docking/launching. If practicable, with passengers, consider using available precision approaches when flying in IMC or at night. accurately log hours flown and manoeuvres practiced to satisfy training and currency requirements. Explanation: Training and proficiency underlie aviation safety. Recurrent training is a major component of flight safety. Such training includes both air and ground training. Each contributes significantly to flight safety and neither can substitute for the other. Training sufficient to promote flight safety may well exceed what is required by law. Pursuing a rigorous, life-long course of aviation study. Follow and periodically review programs of study or series of training exercises to improve proficiency. Adhere to a training regime that will yield new ratings, certifications and endorsements—or at the very least, greater flight proficiency. Train for flight in unique environments such as over water, remote or desert, and mountainous terrain, Train for survival and carry adequate (water-proofed) survival equipment and appropriate water-resistant and warm clothing. Seek the advice of search and rescue or experienced seaplane pilots who have survived incidents. Know your aircraft's performance limitations, how to plan flights and determine fuel requirements. Achieve and maintain proficiency in the efficient and functional operation of technology-intensive aviation equipment. Know current aviation regulations and understand their implications and rationale. Spend time each month reviewing the aviation regulations. Participate in your civil aviation authority Pilot Proficiency Programmes if available. Each month, review reports of recent or nearby accidents or incidents, focusing on contributing factors. Demonstrate conformance periodically to applicable civil aviation authority practical test standards periodically, and complete additional training as necessary to exceed those minimum standards. Before attempting a cross-country flight or carrying passengers in an unfamiliar aircraft, complete at least one training flight in that unfamiliar aircraft model, and discern differences among similar aircraft (that is, same make and model but varying tail numbers). Seek to fly at least once every two weeks and at least one night a month from land (for amphibious seaplanes), to include at least three take-offs and landings, or else refrain from flying at night. Develop a practical knowledge of the mechanics and systems of each aircraft you fly. Join a “type club” appropriate to the aircraft you fly to learn more about it (for example, the Cessna Pilots Association, Lake Amphibian Flyers Club or other aircraft-specific club). Complete the equivalent of a Flight Review annually rather than every two years and, if instrument rated, an instrument proficiency check every six months. Maintain currency including for day, night and IFR operations that exceeds minimum regulatory requirements. Explanation: This Section addresses preventing criminal acts and promoting national security. The events of 9/11 have had a profound impact on aviation in some countries and have created demands for responsive action. Enhanced security awareness by aviators is a stark new reality for the seaplane community in some countries. Accordingly, this section responds proactively to various new threats and vulnerabilities. Become familiar with your local Airport Watch or similar organisation and other means to report and deter suspicious activities. Use VFR “flight following” (in Europe, “Flight Information Service”) when practicable. Always file a flight plan for cross country flights. Avoid deviating from an active flight plan (both IFR and VFR) or from a clearance without notifying ATC. Explanation: Mitigation of pollution caused by aviation activities is important both to the general public, to minimize harm to the environment, and to the seaplane community, to avoid unfavourable public perceptions. Indeed, environmental issues such as noise pollution can close waterways and airports, and otherwise jeopardize seaplane aviation. Other environmental impacts of seaplane aviation have garnered less attention but nevertheless deserve emphasis. Keep fuel absorbent material on board the seaplane and be prepared to respond immediately to fuel or oil spills in the water. Prevent the transfer of invasive species between water environments. Be aware of the noise signature of your seaplane and follow procedures to reduce noise, such as reducing engine power and propeller RPM, as soon as practicable after takeoff. Limit approaches to a maximum of two (in one location) when practicing splash-and-gos to prevent annoying people on the surface. Maintain adequate clearance from populated areas to reduce noise to persons near to the shore. Explanation: Innovative, compact, inexpensive technologies have greatly expanded the capabilities of seaplanes. This Section encourages the use of such safety-enhancing technologies. Use VFR “flight following” whenever practicable. Maintain competency and proficiency in “conventional” flight planning and operations to enhance flight safety in the event of the failure or unavailability of advanced technologies or services. Consider the safety benefits of a gear advisory system for your amphibian. Recognize the safety benefits of cell and satellite phones for water and remote operations. Recognize that programming navigation systems in flight may distract pilots from other pilot duties and increase programming errors. Avoid programming navigation systems while taxiing (for single pilot operations). In IMC, operate with attitude-indicator (AI) system redundancy if practicable and maintain partial-panel proficiency. promote ethical behaviour within the seaplane community. Explanation: Seaplane (and other GA) operations have a well-recognized (and undeserved) public relations problem that is, in many respects, worsening. Vigilance and responsive action by the seaplane community are essential to ensure its vitality and to enhance the aviation experience for both you and for others. Advance the endearment of the seaplane community to the coastal and maritime fraternities. Endear the seaplane community to the boating public as a valuable resource. Approach your water operations as if you are an invited guest on the water. Serve as a seaplane aviation ambassador to the public by providing accurate information and refuting misinformation concerning seaplane activities, and by encouraging potential student pilots. Volunteer in support of seaplane aviation. Consider joining and actively participating in local boating organizations and the Coast Guard. Pilots and the aviation community may use the Seaplane Pilots’ Model Code of Conduct as a resource for code of conduct development, although it is recommended that this be supported by independent research on the suitability of its principles for specific or local applications and situations. It is not intended to provide legal advice and must not be relied upon as such. The Seaplane Pilots’ Model Code of Conduct is a living document, intended to be updated periodically to reflect changes in aviation practices and the aviation environment. Please send your suggestions, edits, errata, questions and comments to: PEB@secureav.com . The Seaplane Pilots’ Model Code of Conduct has had the benefit of extensive editorial comment and suggestions by a diverse body of the seaplane community, and beyond. See “Acknowledgments” at < http://www.secureav.com >. The Seaplane Pilots’ Model Code of Conduct Drafting Group included: Michael S. Baum, Robert B. Curtis, Prof. Dale DeRemer, Ray Hawco, David Wiley, and Walter B. Windus. The Permanent Editorial Board of the Code of Conduct is presented at http://www.secureav.com/PEB.pdf .